The 200-year-old mystery of where some of the world's largest flowers sit in the botanical family tree has finally been solved by scientists. To their surprise, the plants, which have up to 1m-wide (3ft), blood-red, rotten-flesh stinking flowers, belong to a group bearing tiny blooms. The Rafflesiaceae were tricky to place because of their unusual features, the team reports in the journal Science. Such traits include the fact that they are rootless, leafless and stemless. 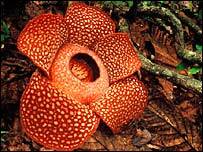 Their giant blooms, which weigh up to 7kg (15lb) and in appearance and fragrance mimic decomposing meat, attract carrion flies that pollinate them. And the strange plants, which can be found growing on the jungle floor in southeast Asia, are also parasitic. Eschewing the process of photosynthesis, the Rafflesiaceae bed down in the tissue of the tropical grape vine, feasting upon the nutrients it provides. The botanists used DNA analysis to delve into the ancestry of the Rafflesiaceae, a group that comprises some 50 individual species. Their research reveals that the plants belong to the Euphorbiaceae family. Plants in this family, which include the rubber tree, castor oil plant and the cassava shrub, are typified by small blossoms, the researchers comment. Charles Davis, assistant professor of organismic and evolutionary biology at Harvard University and lead author of the Science paper, said: "These plants are so strange - almost extra-terrestrial - wherever they were placed [within the family tree] there would be a lot of explaining to do. "The big shocker, of course, is that they fall in the middle of this group with minute flowers." The botanists believe that about 46 million years ago, the plants' blooms began to evolve at an accelerated pace. They estimate the flowers developed from a minute 2mm (0.08in) up to their enormous size during this period. There would have been two main advantages to having such large blooms, Professor Davis told the BBC News website. "These plants occur exclusively in tropical rainforest under-storeys, which are very dimly lit, and they are restricted to the forest floor. They don't have an easy way of presenting their flowers to various insects for pollination," he explained. "By maximising their surface area it is much easier to waft the funky smell further distances, which lures carrion flies. "Their size means they also become a very effective stop sign and visual cue to lure these flies in so that they pollinate the plant."